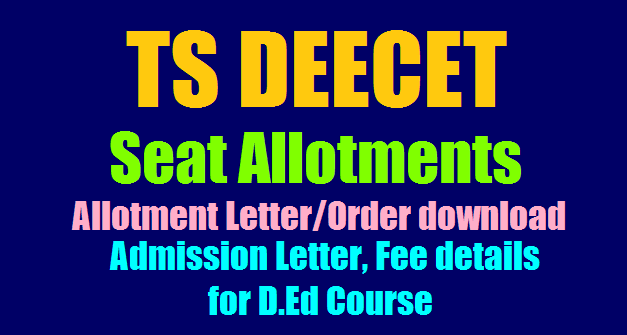 We have provided the direct link to download the TS DEECET Admission Letter. So, we suggest the candidates download the admission letter in advance so you can join the college in time. Without admitting in time for the assigned college, Telangana Government will cancel your seat allotment. On the home page check for the TS DEECET Allotment Order Link. Click on the link and enter your details. Then Admission Letter is displayed on the screen. Download the Admission letter and save the file. The copy of acknowledgement of fee paid in gateway should be submitted in the allotted college on the day of reporting at the college. The Principal / Correspondent of the concerned college shall submit the list of candidates reported in the college to Principal, Govt. DIET concerned on 21‐08‐2017 without fail failing which the college will not be included in the 2nd phase of counseling and further action will be initiated as per rules. On receipt of list of candidates from college in the respective Districts, the Principal, Govt. DIET shall report to the CGG, college wise through tracking service.